Active Edge CherryActive Dried Montmorency Cherries are packed full of antioxidants and are ideal for baking, recipes and snacking. Being high in carbohydrate energy, these cherries are great with breakfast cereals and to eat during endurance events or after training. A 32.5g serving of these cherries provides you with one of your 5-a-day! Montmorency Cherries (88%), Concentrated Apple Juice (12%), Sunflower Oil (<1%). Ideal for baking, recipes, snacking and during/after exercise. May contain an occasional cherry pit. Packaged in a facility that processes wheat, soya and dairy. 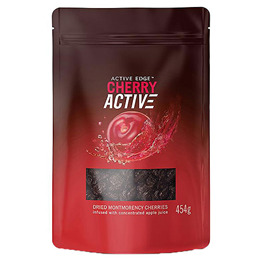 Below are reviews of Active Edge CherryActive Dried Montmorency Cherries - 454g by bodykind customers. If you have tried this product we'd love to hear what you think so please leave a review.